Do you identify as a Baby Boomer? A Gen Xer? A Millennial? What would happen if you could join a new generation? Gen Z is the post-Millennial generation, with a new set of behaviors and attitudes about how the world will work and how we will need to respond in order to stay current, competitive and relevant. In embracing the Gen Z Effect, you become part of Gen Z. Manage and work with the broadest possible range of ages. Benefit from intense collaboration in your work. Build professional relationships that leverage the energy of youth and the wisdom of maturity. Thrive in a world of accelerating change. 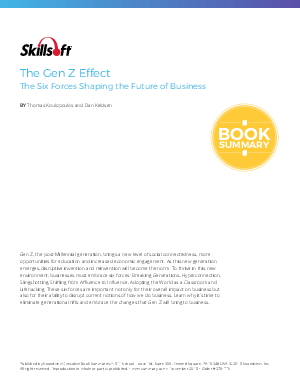 Download Skillsoft’s Executive Book Summary to learn why it’s time to eliminate generational rifts and embrace the changes that Gen Z will bring to business.